Epic Carnival | Where Sports and Pop Culture Collide: J-E-T-S JETS JETS JETS! 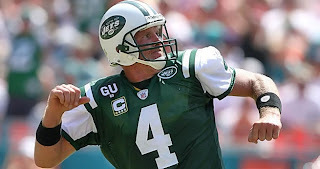 How many more days until I shoot myself over the Jets loving on every NFL broadcast? The main person behind this is the great Brett Favre. They should just change the nickname of the Jets to the Favres since Brett is above the team. The Jets are currently only one game ahead of the New England Patriots in the division. We all know the Patriots are the real leaders in the AFC East with a ton of experience especially on the sidelines. The best thing that could happen is that the Patriots and the Jets to meet in the Playoffs with all the great story lines around it. You have Favre facing off against Matt Cassell who has become one of the best quarterbacks in the AFC and the entire league. We would also have Bill Belichick facing off against his former protege in Eric Mangini. We know how much those two people like each other? They like each other as much as Michael Vick and PETA. In addition, Boston and New York have two of the biggest sports media markets so we would hear about this matchup for a whole week with NFL Live devoted every day to the game with Wendi Nix in Foxboro and Rachel Nichols (Her sweet eyes) in East Rutherford to talk about the game. You can't beat a day without seeing Rachel! PS: Rachel, I gave you my number, Why have you not called me yet?